The Mighty Vaporizer by Storz and Bickel is a premium cannabis vaporizer that has received a lot of attention during the past few years. In our Gadget Review series, we showcase useful and quality of life-improving gadgets that could potentially improve your cannabis use and health. Vaporizers have proven to be effective instruments for the consumption of cannabis and other medicinal herbs. When it comes to the medical use of marijuana it makes sense to avoid harmful activities such as smoking. Additionally, fitness enthusiasts and health-conscious people are forced to renounce the consumption of cannabis if they are unable to afford the time consuming and expensive cooking-method of transforming cannabis flowers into oil. Fortunately, the company Storz & Bickel, based in Tuttlingen, Germany, introduced a new vaporizer series which targets health-conscious individuals as well as medical cannabis patients and eliminates all the negative effects of smoking. On top of that, the device will keep the amount of marijuana that you need for medical treatment far lower than the production of cannabis oil. Today, we are presenting the Mighty Vaporizer, one of the portable members of the Storz & Bickel vaporizer family. When it comes to choosing one of the countless vaporizers, there are a few aspects to take into consideration before deciding which one suits you best. A vaporizer heats up herbs or cannabis by either conduction (direct heating) or convection (hot air). Conduction occurs when the herbs are directly touching the heating element. The main advantage of this is that the herbs evaporate considerably fast. Within seconds of turning on the vaporizer, it is usually ready for use. The most significant downsides are a higher risk of burning and a more irregular heat distribution, compared to convection. Another key element would be the size of your vaporizer. Stationary vaporizers often have the benefit of providing a better user experience at the cost of immobility. Portable vaporizers can usually be carried in a small pocket and don’t draw too much attention in public. If you want to choose the right gadget for yourself, it is crucial that you figure out where and how much you want to use your vaporizer. Other important aspects might be the strength of the implemented battery, steam volume, taste, used materials and the user experience in general. Despite the fact that the Mighty is officially counted as a portable vaporizer, it can still be considered as a fairly big representative of its family. The exact dimensions of the Mighty Vaporizer are 5.5″H x 3.2″L x 1.2″D at a weight of 230 grams. For comparison, the height and length of the Mighty are equal to an above-average sized smartphone. The depth could be compared with a medium sized book. As a consequence, this vaporizer unit could potentially be too big for the pockets of your jeans, but it should still be easy to carry it around in a bag or in your jacket. To achieve the best vaporization from the very first draw, the Mighty Vaporizer is using a patented combination of hot air convection heating and additional conduction. The herbs or the marijuana are kept in the herbal chamber with a gauze filter or sieve. Because of the heating method, it is no longer necessary to shake the vaporizer or move the content for an even evaporation. The content is then heated to the specified temperature. The disadvantage of this might be the higher prices of the materials that are needed to use this more advanced technology, which can also be seen in the premium price of the Mighty Vaporizer. In this category, the Mighty Vaporizer scores particularly strong. Storz and Bickel have given the vaporizer two powerful lithium-ion batteries and thus drastically increased the runtime. With 90+ minutes of average continuous use, it allows six to eleven steamy sessions, depending on the chosen settings. The battery unit of the vaporizer is separated from the heating chamber, which ensures the protection of the batteries and provides the fundament for a long life. If the battery of your Mighty comes close to its end, it can be recharged relatively quickly with its native charger. This, in turn, makes it interesting for home use. 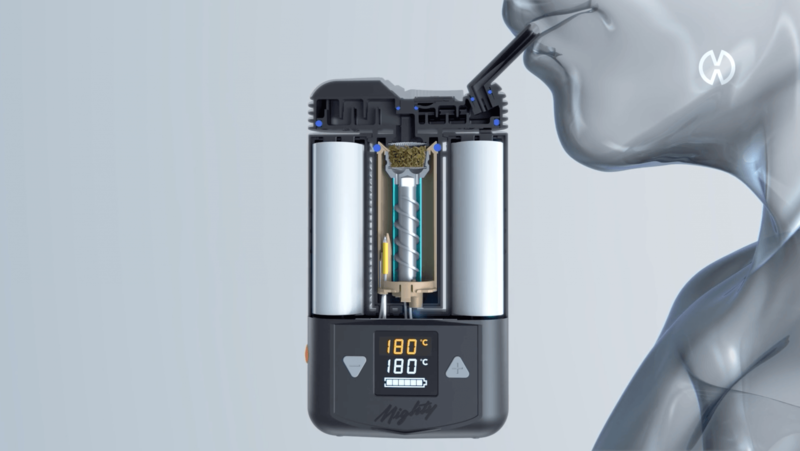 Operating the Mighty Vaporizer is easy and intuitive. It can be switched on via the power button on the side. After turning the device on, it will vibrate and then slowly heat up to the desired temperature within about two minutes. The current temperature will be constantly displayed. The status of the battery is also displayed on the frontal display, where the target temperature can be controlled at any time with the plus and minus buttons. Once it reaches the desired temperature, the Mighty responds with a vibration, which can be quite useful in some situations. Absent-mindedness will not be punished, even if you leave the vaporizer on its left side, because it has an automatic shutdown. The Mighty Vaporizer comes with many practical accessories. For example, there are replacement strainers, cleaning brushes, a herbal grinder and a super practical filling aid, with which the herbal chamber can be easily and conveniently equipped. There is also a drip pad for using oils. The steam quality of the Mighty vaporizer is definitely outstanding and free of disturbing foreign odors. Through the mouthpiece, you inhale the cold, light and satisfying steam. The taste of the steam is the purest cannabis experience one can make. However, the most important quality of a vaporizer is that it is easy to inhale without sucking extremely strong. This is what makes the Mighty Vaporizer user experience the best by far and it explains why the price is located in the higher regions. The rather high price of the Mighty Vaporizer is legitimated by its outstanding quality and longevity, its pleasant user experience and, last but not least, its perfect temperature control. Additionally, it comes with useful gadgets and to our surprise, the plastic grinder is by far the best grinder we have used so far, bringing better results than several different expensive steel grinders. If you are looking to acquire your very own Mighty Vaporizer, we recommend to check out the official website of our partners to learn more about one of our favorite vaporizers. reviewing it 5 years after its release…ok … still nice review!